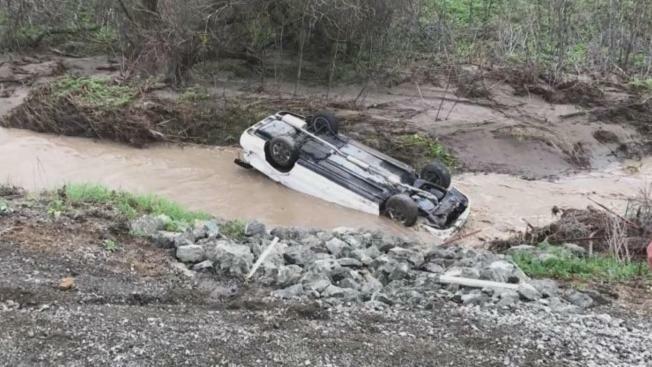 Two good Samaritans are being hailed as heroes after they leaped into a rushing creek near Livermore on Tuesday and plucked out a young driver trapped inside an overturned car. The frightening scene occurred just before 2:45 p.m. when a 20-year-old man lost control of his 1996 Toyota Corrola near Highland and Collier Canyon Roads, California Highway Patrol Officer Derek Reed said. "We heard a bunch of skidding and thought, 'Oh my God!'" said Dan Rich, one of the men who rushed to help the driver. "I thought the poor whoever's in that car is in trouble. He's in trouble." The other man who helped was Rich's neighbor, Clayton Wiedemann. The car careened off the slick road and plunged into rain-swollen water that was roughly three feet deep. It came to rest on its roof, Reed said, and water immediately rushed inside the car's cabin, trapping the driver inside. "I could hear a young man inside hitting the window under the water," Rich said, but the man "couldn't get the door open." Rich and Wiedemann men happened to hear the crash take place and immediately ran to the driver's side. They Wiedemann jumped into the fast-moving water and attempted to pry open the door. "I think the car had bent so the door wasn't able to open," Wiedemann said. Without a minute to spare, the men grabbed a pickaxe from Rich's truck, jumped into the water and proceeded to smash the car's back window. "You could hear a window implode inside and I just started grabbing everything we could," Rich said. "I guess one of the things I grabbed was him. It all happened so fast, he ended up on the bank before we knew it." The young driver only sustained minor injuries, according to Reed. "It was all going so fast, he was still dazed. He was just happy to get out of that car," Rich said. For their part, the good Samaritans said deemed themselves fortunate to have been in a position to help and are thankful the man is OK.
Police originally reported that only one good person was involved in the rescue.